Yes, I shed a tear just watching the trailer. I love when a movie can continue on and is something my children and I both love and know. Looking forward to number four! On the road of life there are old friends, new friends, and stories that change you. Watch the new trailer for Toy Story 4 now, in theatres June 21. Today is National Let’s Laugh Day!! To celebrate National Let’s Laugh Day today, iconic candy brand Laffy Taffy — famous for its knee-slapping, side-splitting jokes on every wrapper — has created the first national survey of the laughter-loving habits of all Americans. Did you know that 96% of Americans enjoy making other people laugh (that's huge!) and 79% of people love the sound of their own laugh? Based on a survey of 1,500 Americans, the Laffy Taffy study reveals how often we laugh, our favorite types of laugh, and even which U.S. states laugh most. Everyone laughs, but not always the same. Nationally, giggles (32%) top chuckles (20%) and belly laughs (19%). 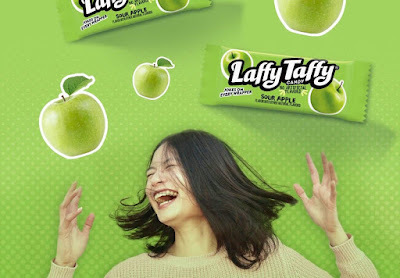 More unique laugh types uncovered by Laffy Taffy include the guffaw (6%), the cackle (6%), and the infamous “cry laugh” (7%). Most Americans love to laugh with (or at) their significant other (33%). Other top sources of laughter include friends (27%), kids (19%), siblings (9%), and moms (7%). Dads, surprisingly, may need to up their dad-joke game (5%). According to the Laffy Taffy study, 95% Americans say laughter is a stress reliever — with 54% saying they will laugh out loud even when no one else is around. There is still time for girls to register to join a team and get active this school year. Girls in grades 3 through 8 can register for the program through one of the 33 participating elementary and middle schools OR, for girls who attend a school that does not currently have its own GOTR team, a GOTR representative will make a referral to the nearest team with open slots. Each team has a minimum of eight and a maximum of 15 girls. The elementary school program is open to girls in grades 3 through 5 and the middle school program is available to grades 6 through 8. Participants meet twice a week after school for 90 minutes to practice. The program curriculum dates and time vary for each school. The program registration fee includes 20 lessons conducted by nationally-certified GOTR coaches, a healthy snack each session, all class materials, end-of-season celebration party, 5K entry fee for both the girl and her running buddy, a program t-shirt, water bottle and a goody bag. More than 700 girls across the Las Vegas valley each year participate in the GOTR program which delivers a season-long, experienced-based curriculum designed to develop confidence, friendship, strength and emotional and spiritual health in young girls—all while integrating running. The season culminates with a 5K event where all GOTR participants come together to celebrate girl power. A list of participating schools can be found at www.GirlsOnTheRunLV.org. Click here to register for the Spring 2019 Season, become a Running Buddy or a community runner. Registration fees vary based on the participating school. Mary Poppins Returns by Disney came out yesterday. I grew up watching the original so I was really looking forward to this movie and let me tell you - it did not disappoint! I took my teenagers to see it as well. I do have mixed thoughts regarding the generation today enjoying the movie. My kids enjoyed it, but they just thought it was just "okay" and a little long with too much music. I honestly see that as being an issue with kids today. It is a little long for someone who is not familiar with the original Mary Poppins and who doesn't have a connection with the movie. 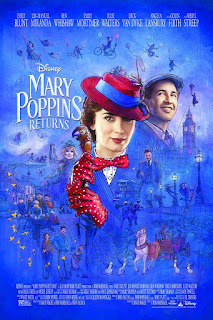 Now on the other hand, for someone like myself who grew up watching Mary Poppins and singing the songs - no doubt you will absolutely love this movie! Disney did a fabulous job on Mary Poppins Returns! Although it was a little long, they hit every point and connected it spot on to the original. I found myself laughing, crying and smiling throughout the movie as the warmth and memories it brought was comforting. The cast as well fit so perfect, I really can't say enough about this movie. If you are over thirty and grew up watching the original Mary Poppins, this will warm your heart! GREAT job Disney!!! Christmas Tree - Let’s face it, bringing a 4 ft. to 8 ft. tree into your home that is only being held up by a small stand with four screws is just asking for trouble with a toddler in the home. I can remember at least one time in my childhood hearing the tree come crashing to the floor in the middle of the night. Toddlers will naturally be attracted by this new item in your home and equally fascinated by the lights. To prevent the tree from falling wrap green gardening twine around the mid-section of the tree. There are extension gates that can be assembled as large as you require. Once you have placed the lights on the tree, be sure to tape any extra length of cord directly to the wall to prevent your toddler from pulling on it and pets from biting it and potentially causing a fire. Ornaments - While you may have many family ornaments that you have used to decorate your tree in the past, store any glass ones away for the next few years. Along with the potential risk of broken glass cutting your child, a curious toddler will try to put one in her mouth. Make sure smaller ornaments are placed towards the top of the tree and consider decorating the bottom with ribbons or larger cloth-covered ornaments. Christmas Tree Lights – Never attach more than three strands of lights together. Pick up some extension cords and read the directions carefully for the best way to light your tree. Some stores may even carry cords designed to go up the trunk of your tree to individually light each strand. Also, make sure you keep them high enough so that your pets don’t think they’re chew toys! Electrical fires are no way to start your holiday season. Fireplace - Nothing is cozier than a roaring fire but make sure children are aware of the dangers. If you have a fireplace in your home, make sure you securely fasten gate or screen in front to protect your area rugs, carpets and furniture from loose embers, and to keep your children safe from burns. Make sure you have a fire extinguisher nearby at all times. Cooking - Whether your kids are helping you bake a gingerbread house or just heating up a cup of hot chocolate, establish some safety rules. Make sure they understand to stay away from hot appliances or plugging in electrical appliances with wet hands. Candles – It’s easy to forget and leave a candle burning when you go to bed. There’s also the chance of a taper candle falling over and igniting a table cloth or drape. There is a wide array of scented electric candles that will look just as beautiful and be much safer to use. The LINQ Promenade will transform into a colorful, magical winter wonderland with candy-themed décor and a whimsical show of music and dance for the annual Holiday Magic display complete with the scent of fresh cut pines during the nightly snowfall beginning this Saturday, Dec. 1. During the week, Monday through Wednesday, carolers will spread the spirit of the season by singing holiday hits from 6 p.m. to 9 p.m. For Thursday through Sunday - a modern twist on the classic - Twas’ the Night Before Christmas - dance spectacular will delight revelers at the top of every hour, also from 6 p.m. to 9 p.m.
Additionally, locals who partake in the merriment can enjoy $5 off the newly-opened FLY LINQ, the only zipline on the Las Vegas Strip. The new attraction features 10 side-by-side ziplines, capable of simultaneously launching all riders. Guests will take off from a 114-foot-tall tower in the direction of the High Roller, “flying” 1,121 feet above The LINQ Promenade at approximately 35 miles per hour. Click here for more information regarding tickets. 3545 S Las Vegas Blvd.